I have been thinking about doing this for a while but got a little usurped by Charlton Life, anyway I want you to join me in a discussion to pick Charlton's best team of the decade from the 2nd half of the 2000/1 season when we began the new century in 2nd place two points behind Man City on our way to the Division One title right up to this season's current crop in the 3rd Division. I doesn't take an awful lot of research to state that the first half of the decade was slightly more productive than the last half nonetheless I am going to pick players not just on ability but also on their consistency and desire in a red shirt during this period. In our 2006/7 relegation Scott Carson was one of only a few players who finished the season in any kind of positive light with Addicks fans. On loan but overlooked, we may have had a chance to sign him permanently from Liverpoool if we'd remained in the Premier League and it would have been a popular (if not inexpensive) signing. He started all but two league games in goal and did let in 55 goals, but one can only wonder how many it could have been if it wasn't for Carson and he deservedly (there wasn't much choice) won Player of the Year. Robbie Elliot is still on one of the lower rungs to Charlton greatness. 44 games the boyhood Charlton fan has played and despite having some detractors most of us were pleased to see him back in between the posts on Saturday and not for the first time this season, he pulled off another vital save with the game finely balanced at 0-0. Maybe when a CAFC team of the centuries second decade is done in 10 years time, Robbie will be a shoe-in like this man. 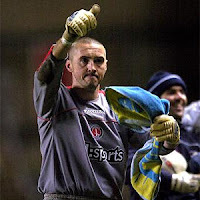 Dean Kiely was signed in the summer of 1999 from Bury for a cool £1m and was Alan Curbishley's first and only signing after we were relegated from our first ever Premier League season. Kiely was already 28 when he came south to The Valley and had started almost 350 league games for York City and Bury. It was about the best million quid Curbs ever spent. Deano played 222 games for us (after 1/1/2000) and his toothless grin and athleticism sits with me now. He won us games in the Premier League almost single-handedly but eventually fell out with the man who signed him. Deano has often since talked about his relationship with Curbishley and the reasons it soured. Charlton unquestionably has a place in his heart and he is now back-up 'keeper ironically to Scott Carson at West Brom, where he is about to be rewarded by boss Roberto Di Matteo with an extended contract as the 39-year old consider's coaching. Deano is a bit of a lay-up as they say in Basketball and the next 10 players in my CAFC Team of the Decade won't be anywhere as easy but he does epitomise everything that was good about Charlton during the last 10 years and actually it better describes what I am trying to do here by saying I am looking for 10 more Dean Kiely's. What are your thoughts?